This past Sunday, as the nation was sitting down to watch the Super Bowl and all of its attendant pomp and circumstance, a massive environmental disaster was taking place near Eden, NC, a small town that sits on the banks of the Dan River and counts an out-of-service Duke Energy steam station as one of its closest neighbors. One might think that the steam station would be relatively harmless now that it’s out of commission, but the Eden plant tore that reasoning into tatters when a broken storm pipe caused somewhere between 50,000 and 82,000 tons of coal ash and up to 27 million gallons of water to spill out of a coal slurry impoundment and into the Dan River. 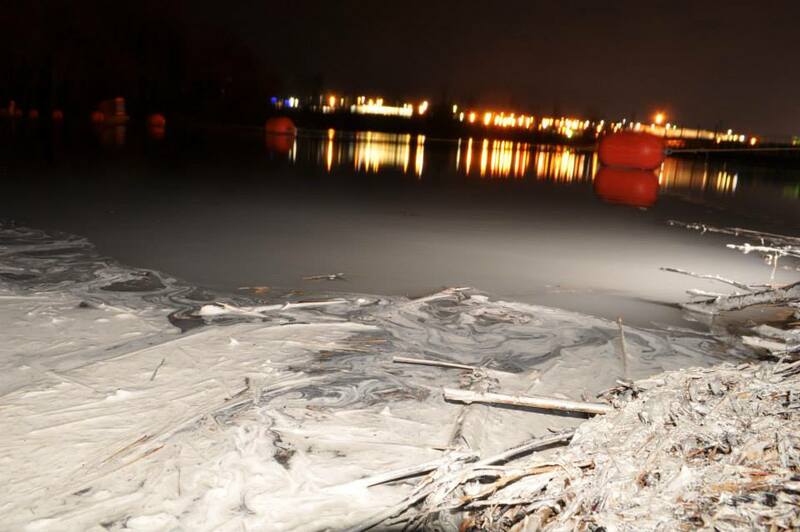 Even if the more conservative estimate of 50,000 tons ends up being true, Duke Energy just dumped the coal ash weight equivalent of The RMS Titanic into a one of North Carolina’s rivers. Naturally, no one would learn about the spill until 4:00pm on Monday because it took Duke Energy and the North Carolina Department of Environment and Natural Resources close to 24 hours to publicly report that a spill had taken place. The pictures and reports coming out of North Carolina over the past couple days have been pretty grim, showing a Dan River whose contents look more like clay slip than they do water. Now, I recently had occasion to write about the perils presented by coal ash and coal slurry in my book, Bread From The Sweat of Other Men’s Faces and have picked out a passage or two that will hopefully be able to provide a bit of context and clarity to the process through which companies like Duke Energy are permitted to so haphazardly endanger the water supply of millions of people. As I was driven through the West Virginian hinterlands, my attention was directed towards several coal processing plants or “tipples” that produce millions of gallons of coal slurry, which is the part-solid/part-liquid byproduct of the preparation processes that get coal ready for sale by washing it of excess sediment and crushing it into fairly uniform sized chunks. The only problem with all of this is the fact that the coal preparation process either utilizes or creates 19-known carcinogens and 24 chemicals linked to heart and lung damage, ensuring that the coal companies will be responsible for billions of gallons of this cancer-causing coal slurry with no way to un-slurrify it, as it were. Big coal thought long and hard on this problem and managed to come up with two environmentally sound ways of disposing of all this coal detritus without harming neighboring communities or local ecosystems…wait…did I say environmentally sound and harmless? I meant incredibly toxic and fatal. In their infinite wisdom, the major coal companies adopted two separate, yet equally destructive methods for coal slurry disposal: injection and impoundment. Coal slurry injection is pretty much what it sounds like it is. The chunky, viscous coal slurry is mixed with massive quantities of water and then pumped, or “injected” into old abandoned mines deep inside the earth where no one can see it—and, so corporate logic has it, it doesn’t exist. The only problem with this is the fact that just because you shove this waste out of sight, doesn’t mean it won’t see the light of day sometime in the future. Big coal doesn’t take the time to hermetically seal every single crack and crevice inside these old abandoned mines, which means that some of this coal slurry will find a way to seep out of the mine itself and into the surrounding groundwater, which in turn pollutes the water supply for nearby communities who, for the most part, still use untreated well water. For the residents of these little hollows and towns, the results of this environmental negligence are deadly, with the water pollution caused by coal slurry seepage and overexposure to coal dust resulting in much higher mortality rates for a variety of cancers, even after controlling for things like smoking habits and socioeconomic variables. The processes involved in coal slurry impoundment aren’t all that dissimilar than those used in slurry injection. The principle difference between the two is that, while injection pushes the waste underground, impoundments store billions of gallons of coal slurry and coal combustion waste through the construction of large earthen dams by using waste rock and clay to seal up naturally occurring basins and create a sort of man-made sludge lake. Just as with injection sites, coal slurry impoundments often allow their contents to soak through into the groundwater through cracks in the earthen dams, which are often shoddily constructed. A recent study conducted for the Office of Surface Mining Reclamation and Enforcement found that only 25% of the field tests they conducted on the walls at impoundment sites meet with passing grades and that all seven of the sites they visited had structural deficiencies. Most of the time, these design issues manifest themselves insidiously, killing off communities by a million tiny carcinogenic cracks and leaks, but occasionally, impoundments have the ability to unleash destruction on a biblical scale, as was the case in 1972, when an impoundment dam busted wide open, sending 132 million gallons of coal slurry down towards the hollow of Buffalo Creek, with 15 and 20 foot sludge waves sweeping through the town, instantly killing 125 people, injuring about 1,000 more and leaving 4,000 West Virginians homeless. Given the carelessness with which the coal companies have built these impoundments and injection sites and the frequency with which they fail, the surprising thing isn’t that tragedies like the Buffalo Creek Disaster have happened, but rather that they haven’t happened more often. However, in the absence of these sorts of headline grabbing catastrophes the folks who live in the hollows and towns adjacent to or downstream from these waste sites and who have been forced to spend their lives drinking water tainted by coal slurry have been dying the slow, unremarkable deaths that are reserved for the faceless and the shapeless and the voiceless. As it turns out, the logic of the coal companies has proven to be true insofar as it relates to the American people writ large. For the vast majority of us, Appalachia is out of sight and therefore out of mind, which means that King Coal can do pretty much whatever it is they want. What, if anything, do you suggest can be done to address these problems?